Buying a specific type of gold coin every year and make a collection out of it is a hobby nurtured by many. Many people buy gold neither for wearing nor for investment purposes, but they find collecting gold coins a matter of pride. When you are buying gold coins for collection, you will want them to be exquisitely beautiful. Gold investment is rising tremendously. Not just countries like India for which gold is a treasure for every occasion whether happy or sad as well as during rich and poor times, but gold investment is picking up momentum in the western countries too. However, gold investment is not so simple. There are so many options available for this type of investment just like other forms of investment that is not impossible to get confused. Gold investment is both lucrative and assuring. There may not be a foolproof guarantee of profits, but there is no heavy risk for losses too. You almost gain what you invested in. Gold coins that are bought at lower premiums over gold prices and promising better returns are preferred as bullion. Why Gold Coin Investment Ranks Higher? There are many types of gold investments like gold coins and bars. However, gold coins are the most preferred due to a variety of reasons. Firstly, they are smaller in size and so, more easily tradable than gold bars. And gold coins are available in a wide range of dimensions, much wider than gold bars thus offering your more options. Moreover, there are different types of gold coins that you can invest in. And each has a different set of benefits than the other. You can buy them from a variety of dealers. You can buy gold coins from online stores too. These different types of gold coins differ in their size, components, purity, and weight. You could find one type better than the other in terms of percentage purity due to less weight of other metals. This weighs 1 oz, and it was originally a favorite with gold coin collectors. Gold coin collectors who are crazy for stocking a date-wise collection of gold coins often find this difficult to accomplish nowadays as minting companies have stopped marketing dates for these every year. 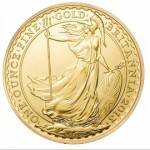 1 oz is the lightest weight that a Britannia gold coin can offer. This coin dates back to more than 25 years ago. Each gold coin comes with a distinguishing, prominent mark, which is its carving on the gold. This Britannia Gold Coin has a unique carving showing the Britannia standing on the shore with utmost pride and holding a trident in one hand and an olive sprig and shield in another. If even you get confused with gold coins, you can easily identify them with their carvings, and nobody will be able to dupe you. These coins are indeed very beautiful and worth investing in. This coin is the flagship coin of the royal mint and was first minted around 500 year back. And it was a real coin that was being circulated for trade until the outbreak of the First World War in 1914. The war conditions provoked all the nations to switch to the usage of the token coin that we use today. The use of sovereign gold coin as bullion was commenced in 1957. The sovereign gold coin of 2013 features the older St. George and Dragon design on the rear and Queen Elizabeth II in the front. These are already in circulation- both ordinary and proof versions. This coin is good both for numismatics and investment. These coins offer you a royal feel. This coin is minted but not yet circulated for the year 2013. The South African Krugerrand coin is famous as it was the first one minted for the purpose of gold investment. This was the starting point of making gold forms that are suited for investment purposes other than the traditional jewellery. An unforgettable name Krugerrand was derived from Kruger, the highly popular president of South Africa, and Rand – the currency of South Africa. 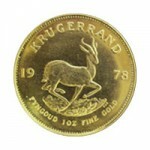 When you hear Krugerrand, it surely rings the country South Africa. If you are looking for coins that are attractive, Krugerrand is definitely not a good choice. The Britannia or Sovereign gold coins are good options for that. But, the Krugerrand coin is certainly good for investment purposes. If you are planning to order gold coins online, make sure you are buying from a reputed gold dealer. One advantage of purchasing gold coins online is that you save money by skipping the intermediaries. Make sure the online payments that you make are highly secure since gold payment will certainly be a huge sum and not some mediocre amount. Once they dispatch the gold coins, make sure they are intact and untouched. Chris is a financial adviser and encourages people to indulge themselves more in investment, as it will help them in the long run. Gold coins are indeed a great investment,some good ones you didn’t mention are the American gold Eagles,their .995 purity and beauty make them a great diversification for any collector,but one important factor I should point out is that investors should be wary of the many scams associated with investing in gold coins,cause there are many dealers who push buyers to purchase what they call rare or numismatic coins,for the reason that they can liquidate them for a premium price,but if you are a new to investing in gold ,just stay away from these because they will ripoff you off of a large amount of money,my advice is to look for bullion coins because this is the safest gold investment for many newbie investors.